Two weeks ago, we had an opportunity to take a big first ride on the new Fox Step-Cast AX Adventure Cross suspension fork, dedicating 2,400 words to dissecting the polarizing yet bump-smoothing fork. 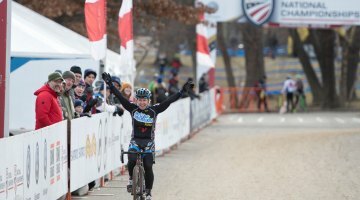 Even before we hit publish, we could hear the upcoming cries of naysayers, despite the fact that more than twenty years earlier, racers won Cyclocross Nationals with 50mm of front fork travel, while this past January at Nationals in Hartford we saw Katie Compton take her 13th title with a front fork pivot. 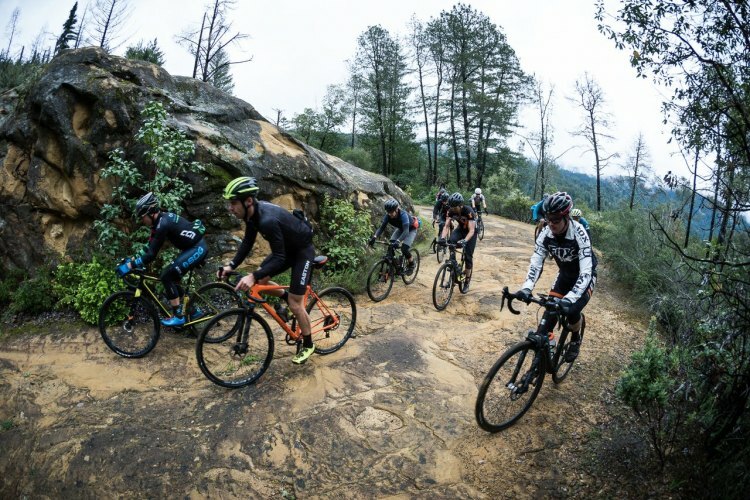 On our test ride, we bumped shoulders with Easton’s Marketing Manager and cyclocross pro Craig Richey (Easton and Fox are part of the same publicly-traded Fox Factory company), who said he was planning on racing the fork in the pro cyclocross race at the Sea Otter Classic. 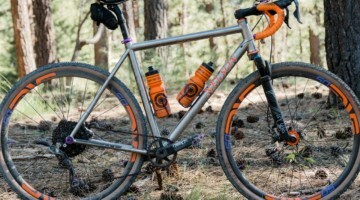 At least for Richey, the fork’s travel made it appealing for more than just gravel and adventure rides. Richey went on to finish third in the race behind Tobin Ortenblad and Justin Lindine. We were curious as to his impressions of the fork in cyclocross racing, and caught up with the admittedly-biased racer to hear about his experience in the form of the race report below. I have been logging miles on the new Fox AX suspension for the past couple months and raced the fork to a third place finish at the pro cyclocross race at Sea Otter. Is this a preview of the future of cyclocross racing or is there no place for suspension in cyclocross? Here is my analysis. Note of Disclosure: I am the marketing manager at Race Face and Easton Cycling which is a subsidiary of FOX. I have tried to look at the benefits of suspension from my position as a ’cross racer but some bias may exist. 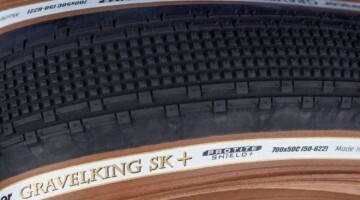 There are a few points to consider such as the tradition of cyclocross, which restricts racers at the UCI level to riding narrow tires and using drop bars when other equipment options might be an advantage. 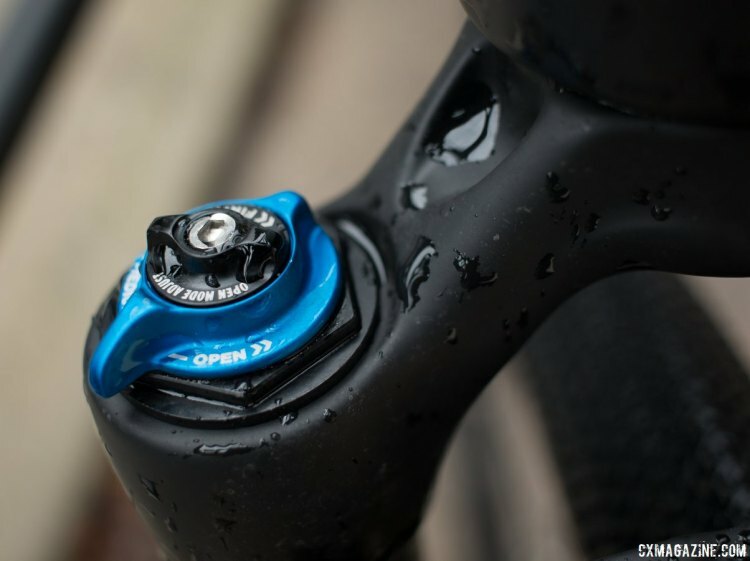 However, disc brakes are allowed, which arguably provides a performance benefit to cyclocross bikes in certain conditions, and so the UCI seems open to technology progress. 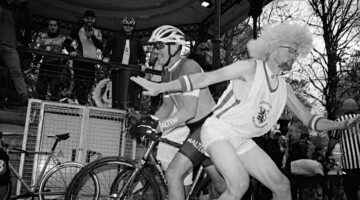 Advances in cycling technology makes bicycles faster and lighter, which gives cyclists a reason to buy a new bike, that in turn gives brands and retailers more money to put into sport marketing, further growing the sport. I would argue that the UCI’s history of not allowing disc brakes for road racing was a significant cause of the stagnant road bike sales. Getting back to cyclocross, I believe it is still possible to allow suspension while still keeping the “tradition” of cyclocross racing. 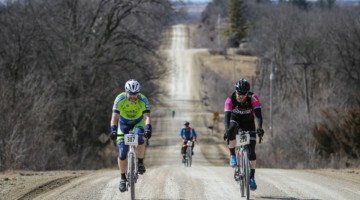 There is also the separate discussion of whether suspension is the future for gravel riding and racing, but I think the answer to that is way more obvious. 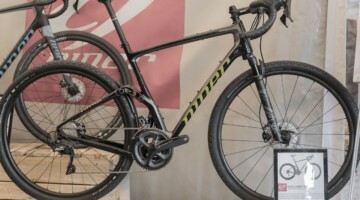 If you’re racing a 5+ hour gravel race, a suspension fork is going to reduce body fatigue and flats, at the cost of a relatively modest two-pound or less weight penalty. 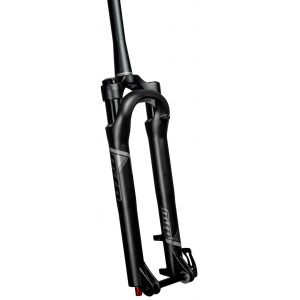 If you have access to a suspension fork option such as the FOX AX fork you would be silly not to use it on bumpy courses. 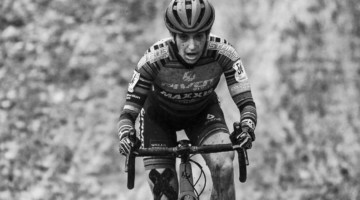 Amanda Nauman (Two-time DirtyKanza Champ) echoed this thought at the AX launch event and then went on to win the 2017 DirtyReiver on the FOX AX fork. 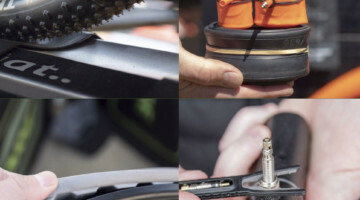 The big question is does a suspension fork make sense for cyclocross racing? 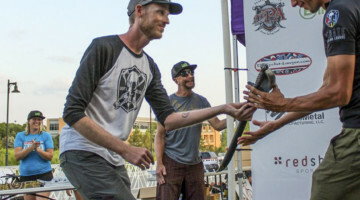 For those who haven’t already read about the FOX AX fork, it is a modified version of the FOX 32 Step-Cast that has been raced to XC World Cup victories. AX stands for Adventure Cross (a name created by yours truly) and this fork has 40mm of travel with an axle-to-crown measurement of 427mm. The suspension works well. 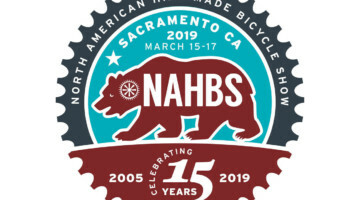 I ran 145psi during the Sea Otter cyclocross race, which gave good pedaling efficiency and still allowed me to use the full travel. 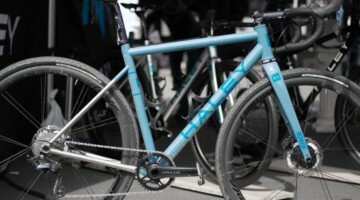 Other suspension fork options also exist for cyclocross racing, such as the Lauf Grit, which weighs only two pounds and has a 409mm axle to crown length. This means the Grit fork will have less of a dramatic impact on the balance and angles on our cyclocross bikes. 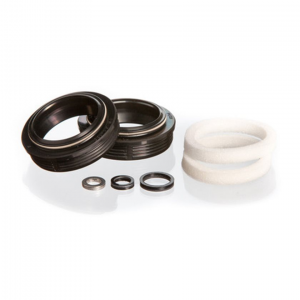 However, the Lauf fork lacks any adjustment on spring rate, rebound dampening and doesn’t have a lockout, so it has its limitations as well. 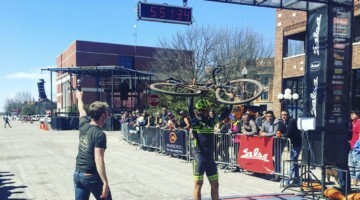 Aaron Schooler raced the Lauf Grit fork last season at the Sunday C1 race at Jingle Cross. I believe his quote after the race was “it felt soft.” I would agree that a suspension fork on a cyclocross bike definitely feels different. I have well over a thousand kilometers on the AX fork, mounted in a Garneau Garibaldi frame, which thanks to the hydroformed downtube, has ample clearance for the fork crown and control knobs. 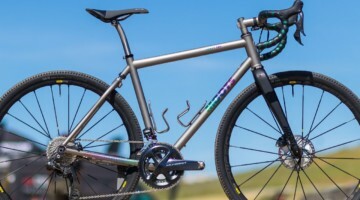 The bike is an alloy frame and has a mid-level gravel build with Rival parts and flared Easton AX bars but a few choice parts such as the EC90 SL cranks and Crankbrothers Candy 11 pedals help keep the weight in check. 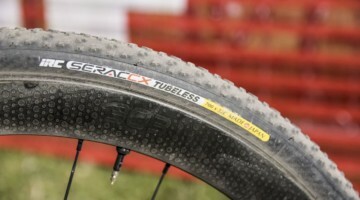 For the Sea Otter cyclocross race, I used Easton carbon wheels set up tubeless with my favorite Schwalbe X-One Allround tires. 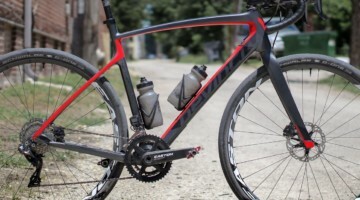 The bike weighed about 20 lbs, which is a significant penalty over my tricked-out Garneau Steeple-X Carbon that tips the scales at around 16 lbs. When it comes to weight. 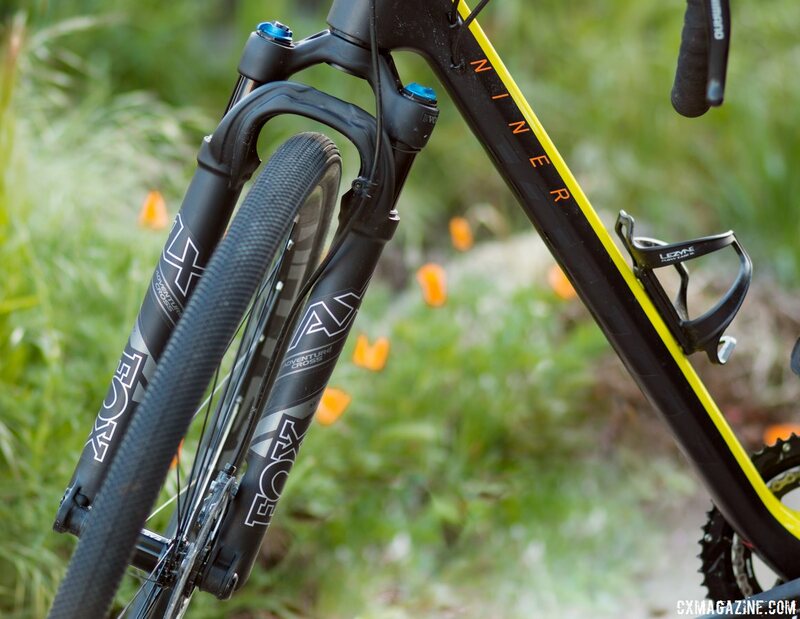 the AX fork adds about two pounds over a carbon fork, which is a not insignificant weight penalty especially on a hilly course. Also the tall 427mm axle to crown is significantly longer than the typical 400mm rigid fork, although one must subtract the (as much as) 10mm of sag. The reduced fork rake helps a bit but the AX fork definitely slackens out the bike’s head angle and raises the BB. 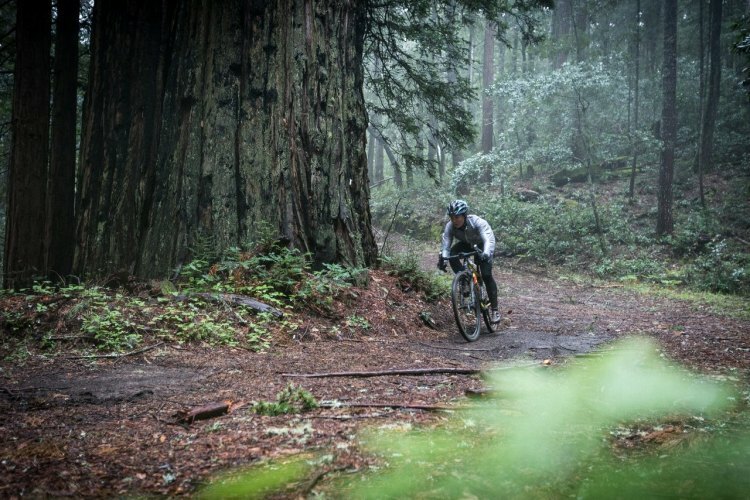 The size large Garibaldi has a 72.5-degree head angle, which is relatively steep for a gravel bike, and with the AX fork, it is more like a 71-degree head angle and still handles well. When it comes to handling, the AX suspension fork was not a significant compromise. 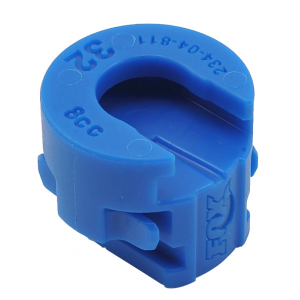 The fork has three modes: lockout, Pro-Pedal, and open. I started the race in the Pro-Pedal mode and raced the whole race in that mode, only locking out the fork for the final sprint. 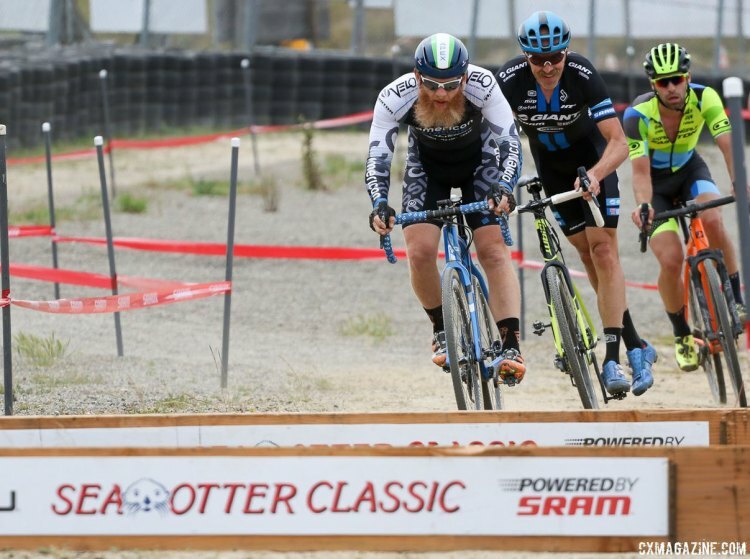 The Sea Otter Classic cyclocross course was essentially the same as the PRO short track XC mountain bike course and was relatively flat which a high average speed, over 30kph. Off the gun, I made the lead group with Tobin Ortenblad and Carl Decker. Towards the end of the first lap, Carl and I ran the barriers while Tobin hopped them to get a gap. After working the Easton/Race Face booth and drinking beer all week, I didn’t have the confidence to bridge back to a hard-charging Tobin, but the heavier bike and suspension fork were not what was preventing me from going with Tobin. I bobbled the sand pit when riding with Justin Lindine and lost his wheel, again no fault of the AX fork. Now I was locked into a battle with Carl and Robert Marion for the remainder of the race. I rarely hop barriers in races, but switched to hopping the barriers because it was faster. On the last lap, I attacked Carl and Robert so I could lead into the barriers and hit the planks with more speed than the previous lap. I was pretty ragged over them and hit the first one pretty hard with my front wheel, but kept it rolling and it allowed me to open a reasonable gap so I could comfortably cruise in for third. The suspension of the AX fork definitely helped me here. 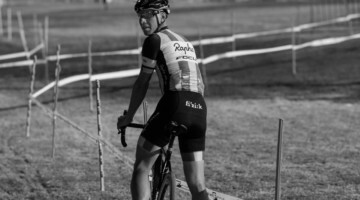 Reflecting on the race and wondering about the what-ifs, I believe if I had been on my rigid Steeple-X race bike I probably wouldn’t have finished better than third, and it could have been a lot worse. With a steeper head angle and no suspension fork, I might have crashed over the barriers on the last lap and would have finished fifth at best. 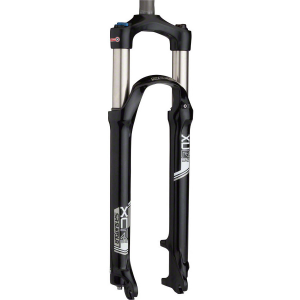 In its current configuration, I think this will be most riders’ experience racing on the FOX AX fork. You likely won’t lose many positions from the weight penalty, but the extra compliance from the fork might save you from disaster. Also, on the rough rutted flat sections I could relax a bit more and be a bit sloppier with my lines knowing I had the extra compliance of the suspension fork. On certain fast and rough North American courses (like a dry, rock-hard Gloucester), I think riders could benefit from racing with suspension. For me personally, I will likely put an Fox AX fork on a backup race bike and if the course or conditions are right, I will race it. 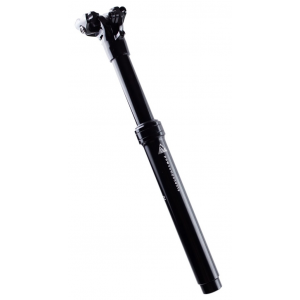 A night race would also make sense for a suspension fork because with the low light, it can be hard to see hidden bumps. 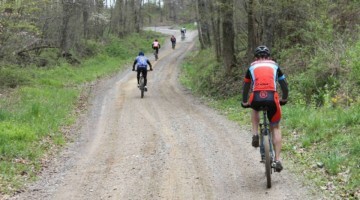 On hilly or muddy courses I likely won’t opt for suspension. 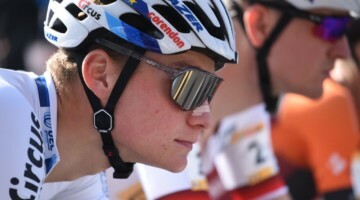 I checked with Stefan Wyman, who is my regular source for all things cyclocross rule related, and he is not aware of any rule banning the use of suspension for cyclocross racing. 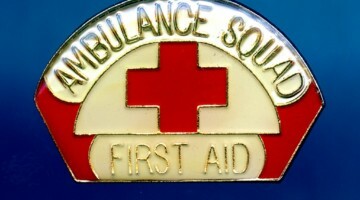 Check with your governing body wherever you live to be sure. 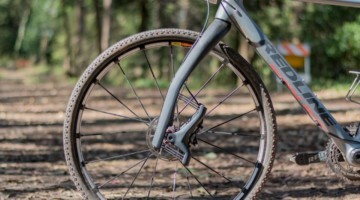 Just like we saw with the first mechanical disc brakes in ’cross racing, the benefits of a suspension fork might be classified by some as marginal. 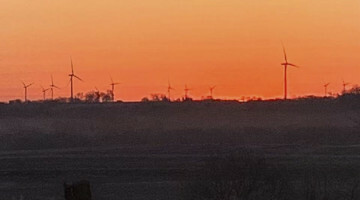 However, the early disc brakes were a glimpse of the future of the sport, and when purpose-built products came to market, the adoption was strong. I think the same will apply to cyclocross suspension. Suspension in cyclocross is the future, at least for me. 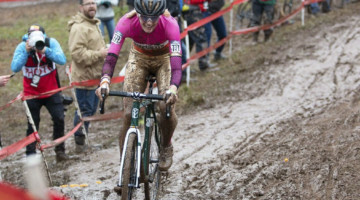 What are your thoughts on suspension forks in cyclocross? Ban them, because I'm rigid. Take my money, I'm going soft. It's complicated and a course-design issue.